Grab your free download of The Life Electric's "Gone, Gone, Gone" before it's gone. 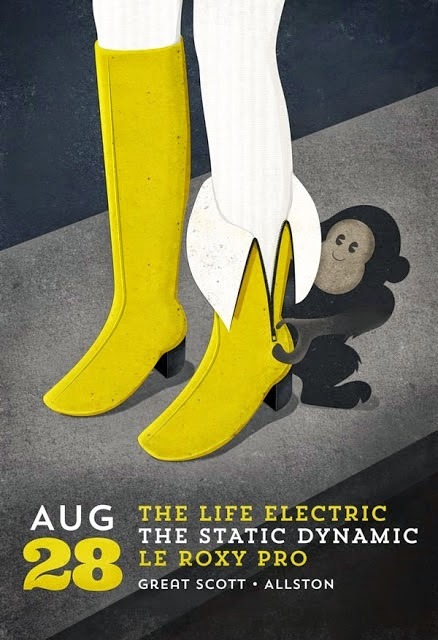 On Thursday, August 28th at Great Scott, Allston, Boston's electro-pop rock band and 2014 Rock N Roll Rumble alumn, The Life Electric, will take the stage with The Static Dynamic and Brent Battey's (The Wondas) new project, Le Roxy Pro. Having opened for the likes of Neon Trees, Crash Kings and Marcy Playground under their collective belt, The Life Electric have set out for the ultimate goal in 2014: to make an epically catchy, inspired, and maybe a little weird full-length record. In anticipation for said record, you can download their 2014 single "Gone, Gone, Gone" (Zippah Records) for free now. Advanced tickets for this $8/18+ show can be purchased online, and additional event details could/should/would be available on the official Facebook event page. Show flyer design by Nicole Anguish of Daykamp Creative.